Document your child's first Christmas with this homemade baby's first Christmas album. Make it for yourself or for friends or grandparents, everyone will love this beautiful keepsake. Make paper sheets as follows: Spread Paper Perfect onto sheet protector with palette knife. Use cellulose sponge to dab off excess moisture. Allow to dry. Peel paper from sheet for use. Needed: one small sheet of Sea Mist; one sheet of White; one sheet of White tinted with several drops of Base Flesh. 1Basecoat wheel and furniture plug Gooseberry Pink. Let dry. Use palette knife to apply Soft Lilac onto album front cover. Use cellulose sponge to dab off excess moisture. Use snowflake punches and white sheet of Paper Perfect to cut out variety of snowflakes. Position and press flakes into wet Soft Lilac on cover. Use scissors to cut holly leaf shapes from Sea Mist sheet and large circle from White/Base Flesh sheet. Position and press these into wet Soft Lilac or wait until album is dry and adhere with glue. Dot Gooseberry Pink next to holly leaves to create berries. 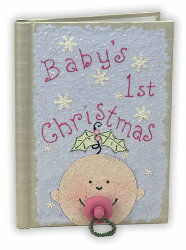 Use Paper Effects to create face, hair, lettering and outline details: Black Pearl for facial features and top knot on baby's head; Peacock Gold for detailing holly leaves, and Pink Pearl for lettering ("Baby's 1st Christmas") and outline of berries. Adhere wheel and furniture plug to form a pacifier. Wrap and twist chenille stem into a loop on pacifier. You can contact the manufacturer DecoArt at httpwww.decoart.com for any of their products. Could not find the main ingredient "Picture Perfect" material. Please advise where I can buyorder this material. I have 4 infants to make books for.